Double the pleasure…but only half the fun? However, I only will be blogging from the grounds for the afternoon before heading out. (Already had made plans for this Wednesday evening a little while back.) We’ll definitely make sure to pack in as much fun entries and photos as possible – maybe a couple of player interviews, which have gotten a lot of good feedback from the readers. What are we waiting for then? Let’s get outside! As always, the most recent blog entries reside at the top. 5:59 PM EST: Sadly, we won’t have any interviews of players available to put up today. That means we’re coming at you guns blazing tomorrow! The interviews, photos and overall silliness from yours truly during my coverage will be on full blast!! You can take it to the bank! Bye for now! 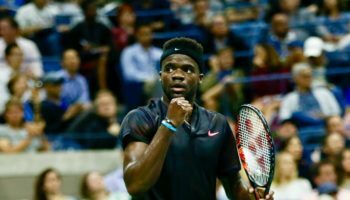 5:55 PM EST: We do have to head out now, but not before telling you that Ryan Harrison just upset Milos Raonic in four sets, 6-7, 7-5, 7-5, 6-1. Amazing win for Harrison on the New Grandstand! 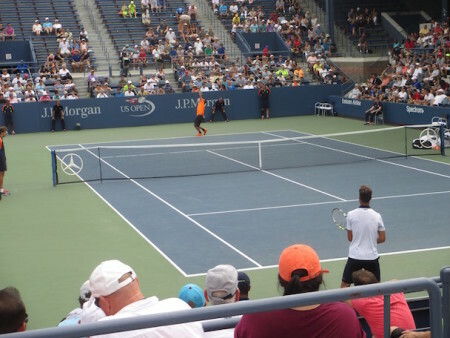 4:03 PM EST: Meanwhile, on the (new) Grandstand, Ryan Harrison is looking to win the second set off of Milos Raonic after the Canadian won the first set in a tiebreak. 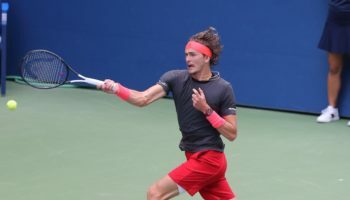 Harrison, once looked upon as the future of American tennis about five years ago, had to qualify just to reach the main draw. Now, he’s up 5-2 in the second and giving Milos a devil of a time on his usually untouchable serve. 3:59 PM EST: Konta has recovered, from what we’re seeing on my monitor. 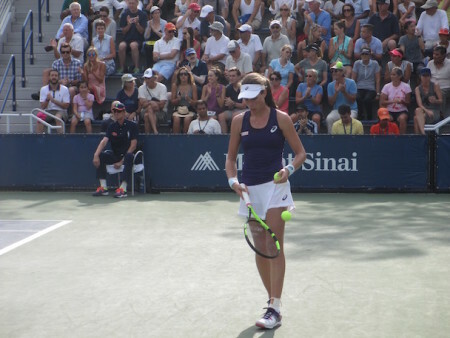 She did lose serve after her treatment on the court to give the second set to Pironkova, but Konta broke back to begin the third set and then held her own serve thereafter for a 2-0 lead. 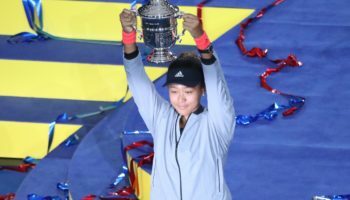 May swing by there, and also may get some video of her after the match, assuming she holds on to win. 3:43 PM EST: I’m now hearing “Stats for Baghdatis” from the media relations assistants as they’re walking around with stats. That means the match is over. Marcos to the third round, 6-2, 6-4, 3-6, 6-4. 3:41 PM EST: Here’s what I saw while walking around after leaving Old Grandstand. Konta being treated…nope, picture not ready yet. Darn Internet connection on my cell phone! Will be up soon. 3:35 PM EST: My word, what a couple of minutes! As I walk out of Old Grandstand, Paire breaks back to get it back on serve. 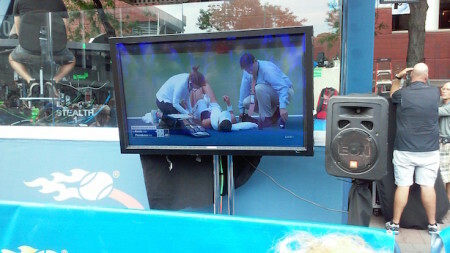 Then, as I’m walking on the grounds, I see a monitor that’s showing Johanna Konta on her back and receiving medical treatment. Cold towel is around her neck and her blood pressure is being taken. She’s up 6-2, 5-6 on Tsvetana Pironkova on Court 13, but I’m racing back to the media room now first. 3:21 PM EST: I thought I was going to leave here, but then I took out my Amazon Kindle and am trying to blog from it for the first time. During that time, there have been back-to-back breaks, and it’s 3-2 in the fourth. Now Baghdatis has another break point. NOW THE BREAK! It’s 4-2 Baghdatis, and he’s two games away from the match. 3:11 PM EST: Paire’s backhand is a sight for sore eyes. His forehand is just sore. But, as I typed that, he hit a forehand winner. Baghdatis wins next two points though, and he holds for 2-1 in the fourth. About to make my way out of here. If this goes five, we’ll be back! …and a photo of Paire after winning a point up at the net…. 3:00 PM EST: A backhand volley winner at net gives Paire the third set, 6-3. Baghdatis now up two sets to one. Might stay here for a few games longer, especially since both bring the drama and eclectic shots. However, Baghdatis no longer is bringing the pony tail and/or man bun. Much more business-like look from Marcos. 2:58 PM EST: I’m really loving the fact that I know which chair umpires are at matches just by their voices. The dulcet voice of Fergus Murphy is here on the old Grandstand! Baghdatis holds for 3-5 and Paire just dropped the first point on his serve with a forehand that went wide going crosscourt. 2:55 PM EST: Paire holds for 5-2 and his one game away from pocketing his first set against Marcos. More importantly, the clouds are winning today, giving us a break from the sun while sitting in the stands! And there’s a nice breeze here. Aaaahhhhhhh! 2:51 PM EST: Those who’ve watched Paire before know that he has an unusual way he hits his forehand. His right hand almost points down to the ground before his arm comes up and is ready to strike the ball. Also, you know he’ good for talking to himself a lot of the court and being very theatrical. That’s why we’re here! 2:47 PM EST: We’re inside of the old Grandstand for the first time this week! Another tier looks like it’s been taken down, but the overhang is still in place and it still has the feel of a major court. As for the match, the Cypriot Marcos Baghdatis is up two sets (6-2, 6-4) but Paire is up a break in the third. 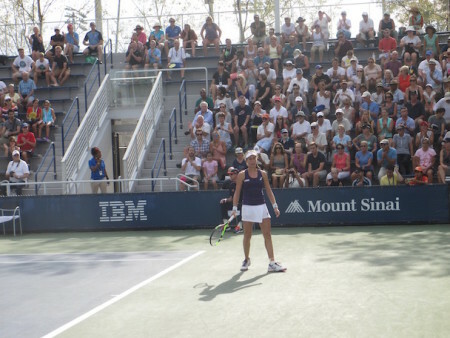 2:26 PM EST: Before heading out to old Grandstand, just wanted to let you know that I was in the media room when I was watching Svetlana Kuznetsova go up 4-0 on Caroline Wozniacki in the first set on Ashe Stadium. Wozniacki won the next six games and won the set. Yikes! 2:05 PM EST: Cancel those cancellations plans for the old Grandstand. Benoit Paire and Marcos Baghdatis are playing now there. Guaranteed theatrics. Might start out there first. Still haven’t made it out to the once-venerable original Grandstand. 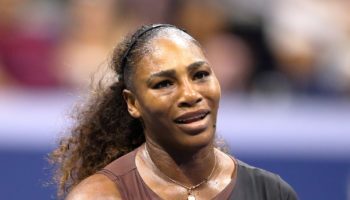 1:51 PM EST: Well, it looked like I was going to put in an interview request with American Lauren Davis, who was up 3-0 in the third set against No. 22 Elina Svitolina of Ukraine. I’m seeing the scoreboard now, and Svitolina ended up winning the last six games of the match at the old Grandstand. Well, there goes those plans! 1:48 PM EST: Sadly, Julio’s US Open appearance this year ended like it did last year: a first-round loss. 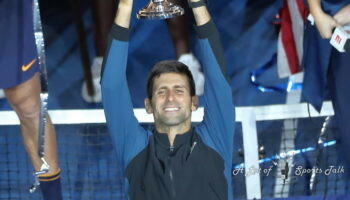 But it’s still nice to know that someone whom you can call a friend participated in a Grand Slam tennis tournament. Will definitely have to shoot him an email and say hello. 1:41 PM EST: Just found out that Peralta, aged 34 now, won his first two ATP Tour-level doubles tournaments earlier this year, both with Zeballos: the Brazil Open in February and the Swiss Open last month. You go, Julio!! 1:30 PM EST: Well, how about this? We start our doubles coverage by watching the team of Julio Peralta of Chile and Horacio Zeballos of Argentina play their match on Court 7. Remember Peralta? We covered him and his then-partner, Matt Seeberger, in New Haven, CT for the U.S. Nationals at the Connecticut Open. They won the tournament and earned a wild card, and we sat with the Seeberger family as they narrowly lost their first-round match. Well, it’s not looking good for Peralta, as his team lost the set 4-6 in the first set and are down a break in the second. 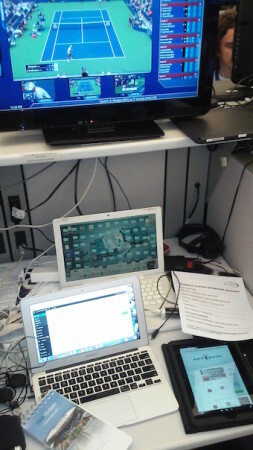 1:14 PM EST: If you didn’t think I was ready for work today, here’s my desk. Let’s go! 1:07 PM EST: Finally set up in my room, and looking up to see that Andrea Petkovic is about to lose to No. 24 Belinda Bencic. Would have loved to follow up with Andrea about how her reunion went with her friend from Monday.